Self-Contained evaporative cooler Systems are the ideal industrial cooling / warehouse evaporative cooling available in UAE market today. The most economical way of cooling for large spaces provides 100% fresh air with a leak proof, very large air flow providing big storage area lower temperatures for indoor space. 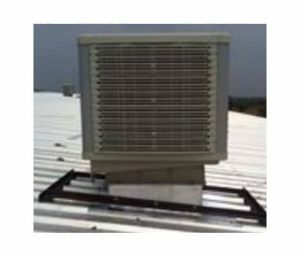 This fixed installed ducted evaporative air cooler roofing systems are an ideal cooling solution for all industries and warehousing projects. We can be evaporative coolers with air flow up to 30000 cubic meters per hour. Which can provide the cost effective evaporative cooling system? Since its uses water evaporative cooling. It is aesthetically appealing and highly cost-effective in comparison to other air conditioning solutions. This evaporative cooler has various advantages including large air flow, 100% fresh air, less power consumption, reducing heat load inside the factory, with low installation cost it can be the best cooling solution today warehousing, food industries, pharmaceutical industries, automobile industries, etc.